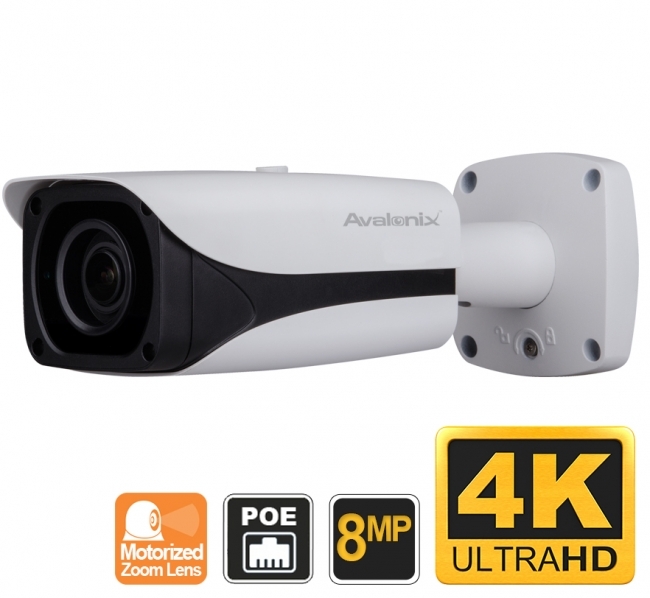 This 4K Long Range Security Camera serves as the industry’s top 4K Ultra HD motorized zoom security camera with its optical zoom capability that’s unmatched by any other 4K security camera on market. Distance is simply not a factor, as this Ultra HD security camera is able to identify a person’s face over 250ft away at maximum zoom, and has an astounding 330ft of infrared night vision. Easily plug this camera into your one of our NVR to view it remotely and record pristine high-resolution 4K video recordings. For top of the line video surveillance when the well-being of your home, business, or property is at stake, the 8MP Long Range 4K IP Bullet Camera with 7-35mm motorized zoom lens is the perfect security camera to keep your mind at ease while you’re away. One of the many advanced features of this 4K IP security camera is its ability to encode video in H.265 or H.264. H.265 is the new standard, offering 30-50% bandwidth savings while delivering the same video quality as H.264. Our 4K security cameras go a step further and feature Smart H.265+ encoding technology that uses scene adaptive encoding strategies to provide additional bandwidth savings, i.e. 70% savings over standard H.264. This translates in to significant savings in hard drive storage space and cost, especially in large security camera systems. Further, the reduction in bandwidth reduces load on network infrastructure. With this camera, like our other 8MP 4K IP cameras, you can record uncompromised 4K Ultra HD video at 15 frames per second (fps), or record real time 25fps at 4MP for smooth HD security video. The motorized zoom varifocal lens allows for increased versatility while providing impeccable video images at significant distances. The 7mm lens, providing a 38° angle of view, will allow you to identify a person at 75ft, or zoom in on your subject by setting the motorized lens to 35mm and be able to see a person’s face over 250ft away. If your old 1080P or 4MP camera is not providing the clarity you need or simply can’t see far enough, replace it with this 4K Long Range IP Network Camera using your existing CAT5e network cable. The 8 megapixel progressive scan CMOS Image Sensor on the camera records 4K Ultra HD video (3840×2160), giving you clarity that’s 4x better than HD 1080P. With this significant increase in camera resolution, you will have a remarkable digital zoom image (recorded video that’s zoomed in), opposed to 1080P digital zoom that will be pixelated. These details are crucial when identifying a person for prosecution, and with this security camera, nothing is left to question. Owning a 4K camera doesn’t mean you need to have a 4K monitor. A monitor with a lesser resolution can still display 4K video. You will still be able to record your video in 4K resolution, but easily adjust the settings on your NVR so that your video output display suits your monitor’s resolution settings. IP security cameras from CCTV Camera world offer convenient plug-and-play technology, making setup as simple as connecting your camera to one of our PoE NVRs using a single network cable. One ethernet cable transmits power, video, and data up to 300ft without the need for a repeater. For those discouraged about setting up IP cameras, you can rest assured knowing that pristine Ultra 4K HD video is only two simple network plugin connections away. This 4K network camera comes with technology that automatically adjusts its exposure depending on the light conditions, preventing you from missing a potentially crucial detail. For example, use DWDR (Digital Wide Dynamic Range) when pointing the camera at an area with glare, such as a parking lot full of cars with a street light. The DWDR feature will offset the bright and dark areas of the camera location, giving you a balanced and recognizable video image. The Backlight Compensation (BLC) feature on this camera is used to enhance a foreground object with bright light behind it, preventing the background light from causing the auto iris to overcompensate the brightness, which make the object you want to see too dark. This UltraHD 4K security camera also has Highlight Compensation (HLC) to help with video that has extreme light in the foreground. The functionality and technical capability of CCTV Camera World's security cameras has evolved beyond basic functions such as motion detection recording. Those features are still available with this 4K security camera but now, also included are Video Analytics. When used with our 4K NVRs, features such as Tripwire, Intrusion, Missing or Abandoned Object detection allow for other methods to detect changes in the surroundings. Whereas most cameras have grainy or blurry images in low-light conditions, this camera will give you exceptional detail using 3DNR (3-Dimensional Noise Reduction) technology. 3DNR is a step beyond DNR (Digital Noise Reduction), which is even more efficient at reducing image noise. This comes in handy when installing a security camera outside to record video overnight or when recording motion. Not only does this camera have features that allow for clear images in low-light conditions, but it can also record color video at night with the presence of ambient light, thanks to the camera’s 0.05 Low Lux sensitivity. During instances of complete darkness, the camera will automatically switch to black and white to provide stellar 4K nighttime video with up to 330ft of night vision. Some customers are apprehensive about leaving their security cameras outside in the elements, but there is no need to worry with this camera. It has an outdoor rating of IP67, meaning it can withstand outdoor weather, such as wind, rain, snow, and dust. It can even operate in temperatures as cold as -22°F or as hot as 140°F. The metal casing is designed to keep your 8MP Long Range 4K IP Bullet Camera 7-35mm Lens. I need this type but wireless. What should I be looking at? You can convert any of our wired network security cameras in to wireless by following our wireless security camera guide. It involves using a wireless access point. I have a long driveway 400ft. I'm not looking to get all of the 400ft but would like to get the most that i can. Right now I have a CAT6 run and I would like to be able to look on my iPhone. Can this camera do that? 400ft is a stretch but it would provide general detail beyond 150ft. Please watch the video sample located underneath the product image thumbnail to understand the viewing distance provided by this 4K security camera. I have cameras connected by coaxial cable, would like to switch out to these. Is that possible? This camera you asked about is a network based camera. You can't use it over coaxial cable. You will need to redo the cabling to CAT5e to use a network camera. If you have coax from a roll of wire where the ends were terminated by hand and crimped, then you may have RG59U wire. If so, then you can use our 4K over coax cameras along with one of our 4k DVRs (not NVRs). The best route would be for you to first provide pictures of your current cabling so we can determine if your current is up to par to support this 4K over coax camera. As stated it shows 7-35mm motorised zoom, what is the size of the sensor. Or what I'm trying to figure out what equivalent it is compared to a 35mm still camera? Also we are looking to use it in a industrial setting and wondering if it can be left at 35mm and record internally in a loop? And if there is an event to power off and take the card out download it? Or can the card content be downloaded through the network easily? I assume the quality on the card is higher bitrate than the stream ? I know a lot of questions, sorry about that. I got a cctv system at home with external recorder but nothing like the high quality gear here hence I'm not sure what applies what doesn't. The specifications state the size of the sensor. You need to scroll down further in the page to read the specs. You can set the camera to a lens position and let it record to the SD card in auto-overwrite mode which will overwrite video as the SD card is filled. To keep the camera weather resistant the SD card goes inside a flap in the camera. Frequent removal of the SD card is not recommended as it will damage the slot and flap, and create a greater possibility of leaving the flap inadequately sealed. It is advised that you access the camera over the network using either internet explorer or our windows client software to access the footage or snapshots on the SD card. The quality of video you store on the card can be set according to the stream you decide to record. The quality of the stream you watch over the network can be up to 4K depending on your network bandwidth. You can record or stream the main stream or the sub stream of the camera based on your preferences. You can learn more about how to record to a SD card with our cameras by reading our guides on recording to a SD card on your security camera. Any of our NVRs on this page that have the 4K logo in the product picture would work. We can only guarantee compatibility with our NVRs. As concerns the software, all of our security cameras come with a free client software for viewing if it is an IP camera. If you wish to record you will need the NVR to setup a proper security camera system, or you can record for short durations to an SD card. If you don't want to purchase a NVR, here is good guide for you to read through on how to use a security camera as standalone.